If your mobile site still mostly consists of static pages, maybe it’s time for an upgrade. According to new data from Usablenet, adding just a few interactive elements could increase your users’ engagement with your site significantly. Usablenet, which describes itself as a “technology platform for mobile and multichannel customer engagement,” says that when brands on its platform started using HTML5-enabled features like interactive galleries, location services, overlays and expandable (or collapsible) boxes, their pageviews increased by 11% and their bounce rates decreased by 15%. In total, sites using these features experienced about a 28% increase in overall usage. Usablenet’s customers include major enterprises like Expedia, Tesco, Amtrak, American Airlines, OfficeMax, ShopNBC and online fashion marketplace ASOS. Jason Taylor, Usablenet’s head of innovation and platform strategy, told me earlier today that most of this data is based on looking at how the retailers in the company’s portfolio use its HTML5 platform. 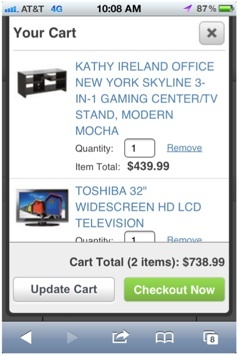 In this context, an overlay with a shopping cart, for example, can help retailers speed up the mobile purchase process and lower its shopping cart abandonment rate. Usablenet also found that using a phone’s built-in GPS feature to determine a user’s location (instead of asking for ZIP codes) to enable features like checking for local inventory helped lower abandonment rates. Given the small size of a mobile phone’s screen, expandable boxes with more information about a product also help these retailers add more information to product descriptions without forcing users to open up another page and potentially leave the site. The HTML5 standard is, of course, still in flux. Because of this, it doesn’t come as a surprise that cross-browser compatibility is at the top of Usablenet’s clients’ wishlist. Interestingly, Taylor also noted that many of the retailers that have switched to its HTML5 platform would also like to use phone cameras as a barcode scanners in their mobile web apps. Given the current state of HTML5, though, that’s still relatively difficult.